At frida&frank we work as urban catalysts to change people’s perspectives on public space. We believe in placemaking through experiential learning and play, prioritizing impact over outcome. We see our cities as urban ecosystems and believe in nurturing a symbiotic relationship between people and their environment. As women in urbanism we are also interested in creating a community that supports each other’s creative endeavours. 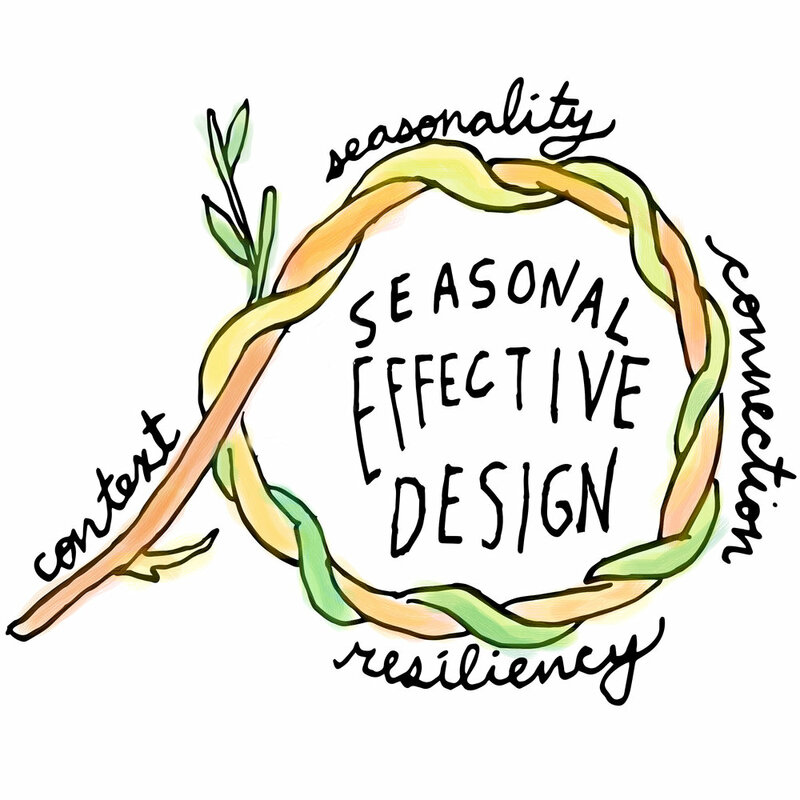 By approaching placemaking with an intersectional lens we draw from disciplines such as art, music, ecology and cuisine to bring new approaches into practice. Most importantly, we believe in the power of conversation and collaboration. With the concept Pop-up Ping-Pong: The Tables Have Turned we invite people to get involved in redesigning public spaces, which touches on an important aspect of our vision; public space is a playground for people. The design of spaces could be in the hands of people using the space more, and that’s why we want people to turn that table with our concept. Through offering the possibility to create a ping-pong table out of several pieces of wood, participants will experience a sense of belonging and ownership as well as form social ties to the space. “When the tables are turned, the situation has changed giving the advantage to the party who had previously been at a disadvantage." Why ping-pong? Ping-pong has the unique ability to create a conversation between two people through the action of play. Play literally means to “engage in activity for enjoyment and recreation rather than a serious or practical purpose”. We want to add to that inherent ability by providing the ping-pong balls with questions about the use and experience of public space. Both on the spot and through social media we will collect the input of people that participate. 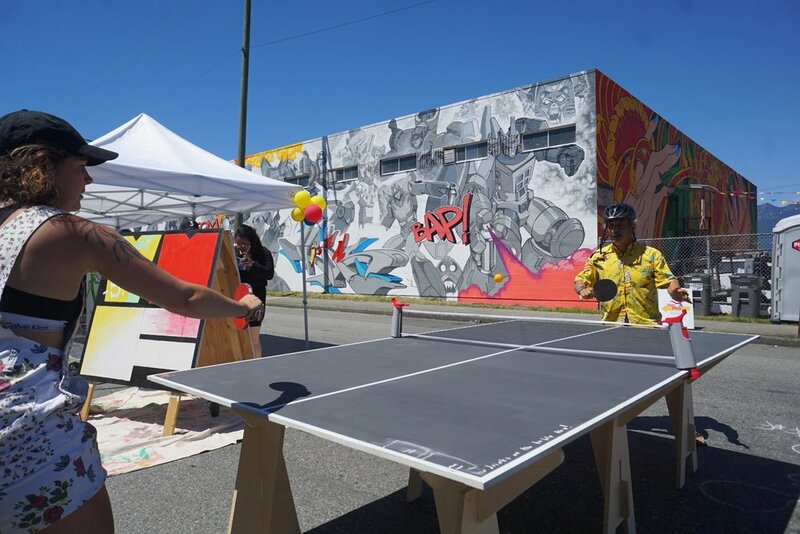 In June 2017 we were (gratefully) awarded a grant by the City of Vancouver's VIVA-refresh project, allowing us to fund and promote our pop-up ping pong events. Throughout the summer and fall of 2017 we had over 40 activations throughout the city from Granville Street to the Arbutus Greenway. We have currently built 4 tables, one of which was specifically for the Youth Collaborative of Chinatown. We fabricate all of our tables locally at Makerlabs using Baltic Birch. During the summer of 2017 we experienced the formation of a place-based community that was driven by the intrigue and excitement of creating public space that feels like home. However, due to the change in seasons we realized that there might not be the same attendance as in the summer months, as well as how social isolation and season affective disorder become even more pressing during the winter months. 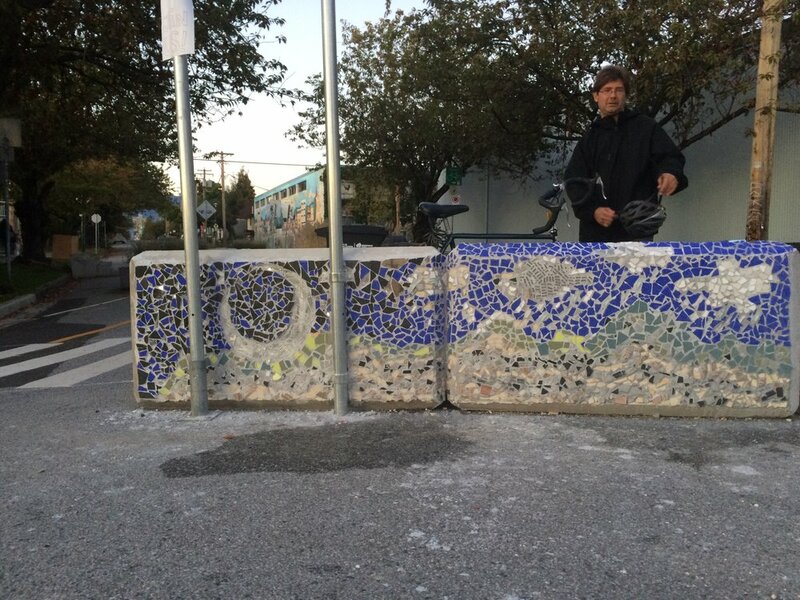 We began to realize that the city isn’t designed for people to play with the rain, even though it is a part of our daily lives here in Vancouver, and that we should see this as an opportunity for solving a creative design challenge. Although the projects hasn’t been completed yet, it is still a conversation that we should be having. In January of 2017 we created a (w)interaction grant to invite other creatives and doers to activate public spaces throughout the city of Vancouver as well as in Berlin and Rotterdam on January 27th. 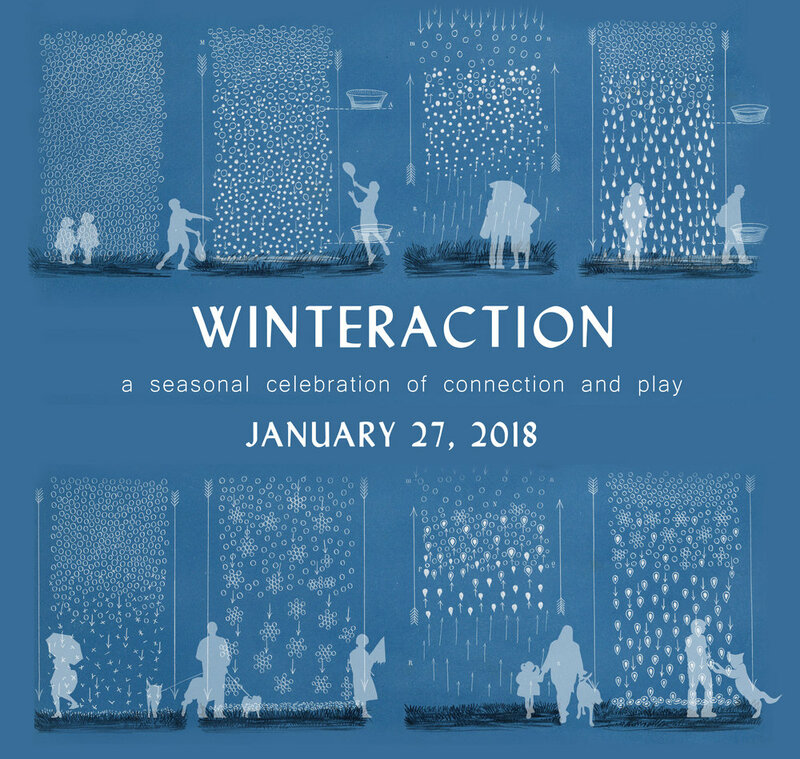 For winteraction, we collaborated with the Vancouver Design Nerds, Viva Vancouver, and our CityHive Youth Hub to create a place of refuge and to push boundaries on what public space can offer in the wintertime. The inflated space created an open platform for public space storytelling, a design jam, as well as a light show by Hfour, and ambient music sets. We helped with the design process, construction, facilitation, and planning of the event. The bubble seemed to evoke a humble curiosity where people went inside with the understanding that it would be somehow different than outside the bubble. everyone who entered participated in the activations and discussions and was very intimately involved in a way that was different than if there wasn’t a plastic sheet. the bubble created an invitation for people to interact in new ways and put their realities on hold momentarily to experience something new without expectations. images curtesy of the Vancouver Design Nerds. We received a small grant to participate in Shaping the Courtyard outside the Vancouver Chinese Garden in Chinatown on August 23rd & 24th, 2018. We believe that play is one of the most important ways of activating public spaces, as well as inspiring cross-cultural learning. With the Youth Collaborative for Chinatown, we showcased some of the pla(y)cemaking work they have been doing through ping-pong, majong, chinese chess, and more. We invited people of all ages and backgrounds to come together in making Jiànzi "shuttlecocks", which can easily be crafted with materials found around. Traditionally a Chinese folk game, this little toy has a way of encouraging play, aerobic exercise, and concentration through finding the precise moment in which to kick it into the air. 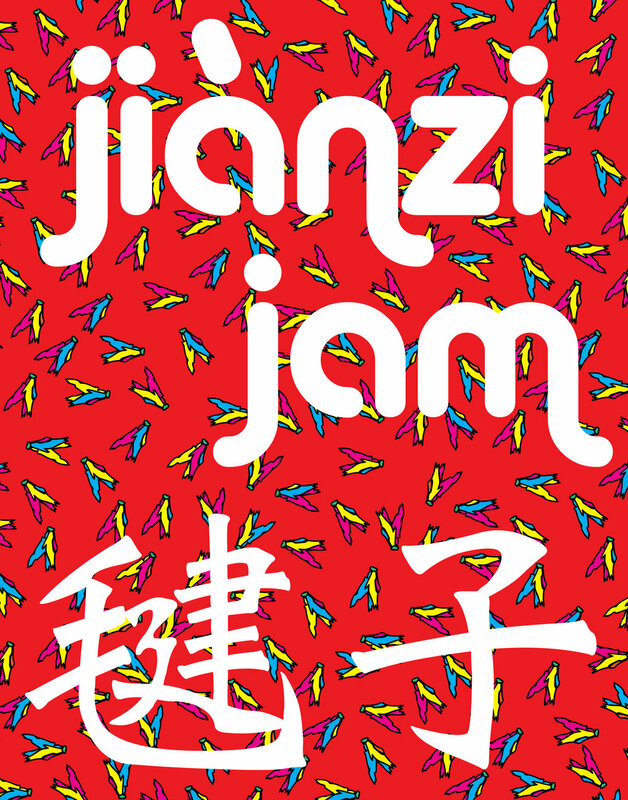 We hoped that people will take their Jianzi's and enliven public spaces throughout the city after the event. Viva Vancouver, City of Vancouver, Arbutus Greenway, Downtown BIA, Strathcona BIA, West End BIA, Granville Island, Vancouver Mural Festival, Public Disco, Makerlabs, Culture Crawl, HUB Bike the Night, New Forms, Basscoast Festival, Publik Secrets, CityHive, Vancouver Design Nerds, Centre for Digital Media, City Farmer, Lumiere Festival, Play Streets, and more!